I got it when i bougth all my LR and thought it looked cool then it started getting these little pink and now turning green things on it one at a time. And it is still growing more! Reminds me of flowerpot goniopora. So is this a yes or what because i dont know the names of all of these yet and i have looked for it but nothing directly matches the look of it. Yes it is a coral. Looks like some sort of lps. I have one on a piece too, can't recall the name. I think it looks more like a faviia that is feeding with its sweeper tenticals out. Click the red house to see my 90 SPS build. Im just tryin to find out what it is because like i said, i got it DEAD in a live rock batch from my LFS and I got it to grow. But for some reason (most comments about it) I dont think its growing back to what it was, I think its growing something new. Should I try to take more pics of it like the bottom of it maybe some closer shots(which is hard) and maybe with the polyps closed? Should I put it in the Guinness Book Of Most Retarded Corals? I would let it develope a bit, as it is definitely on the heal. Could be a Galaxia or Favid. Give it time to get good and healthy. we DO NOT feed the blastos!!!! 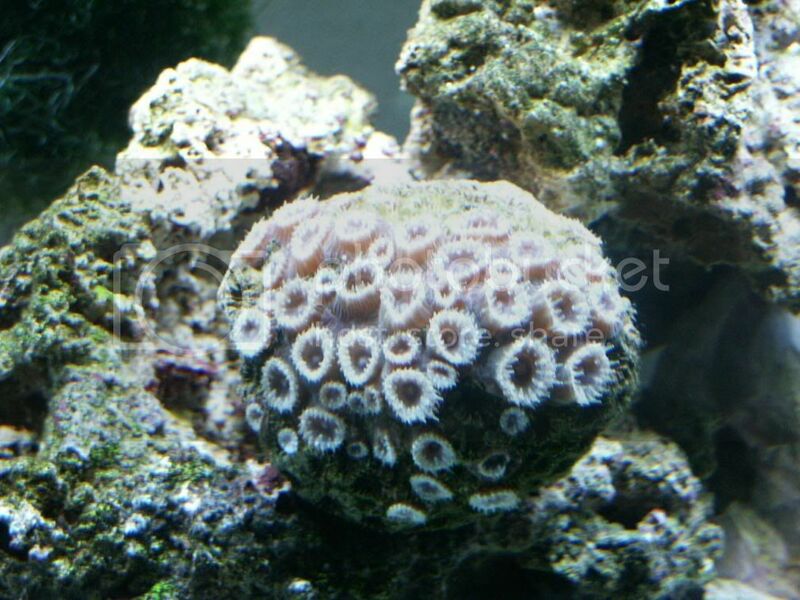 What you have is a Montastrea, possibly M. curta. This group of Favids is distinquished by extratentacular budding, which is to say, the new daughter polyps develope between the others, rather than an adult polyp dividing in the middle (typical of Favia, Favites) Do you know where this cral came from? There are Atlantic and Pacific species of the genus. Also, how large are the individual adult corallites? 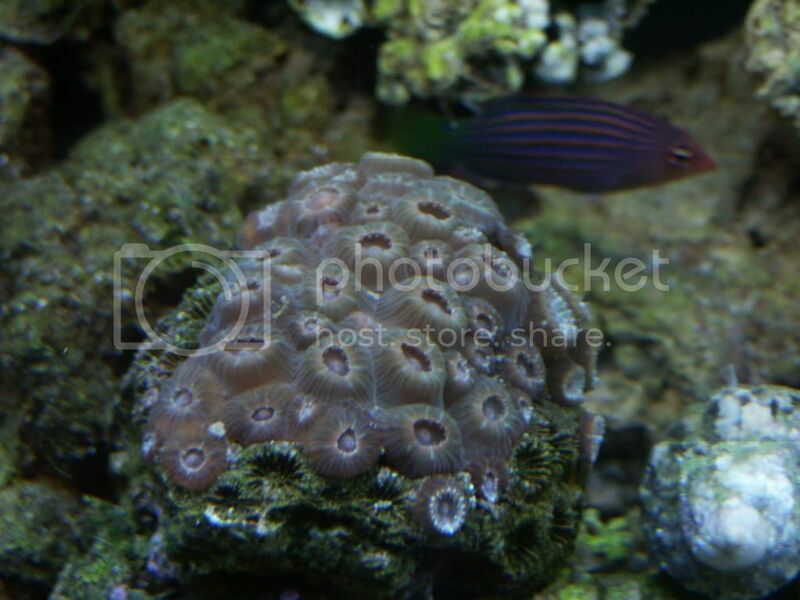 i believe he is asking about how big is the biggest polyp/ the adult polyps or coralites. On second thought, Diploastrea Heliopora...My #2 choice. Its definetly not a goni...not even close. OK, what I'm going after is the diameter of a single coralite. 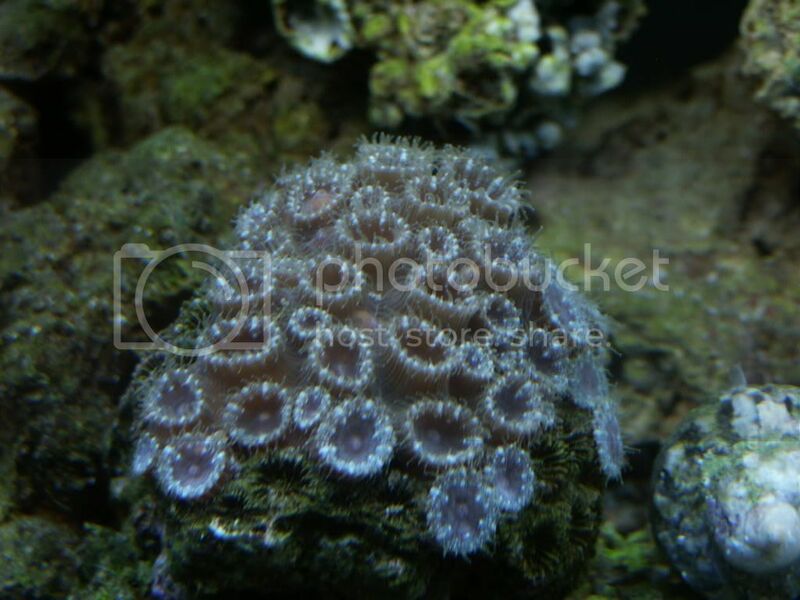 If they are 1/4 inch, which is about 6mm, then it belongs to the smaller polyped species of Montastrea. M. curta is the most likely species. It fits the size and extratentacular budding. For the record, Diploastrea species do not have extratentacular budding. Oculina has a different skeleton. It is an interesting, if somewhat common coral. It is often a dominant species of certain reefs. My vote is still for oculina! Yea they are all about 6 cm and just out of curiosity do you think it will fill out? I think you mean 6 mm, not cm, but, yes, they will eventually recover the naked skeleton. They will overlayer the existing skeleton with new and colonize it further. It takes time. I have one Favid, a Favia, that was damaged and it required a good year to recover completely.